I can't say I am all that impressed by this latest poster. It's okay, but nothing spectacular by any means. 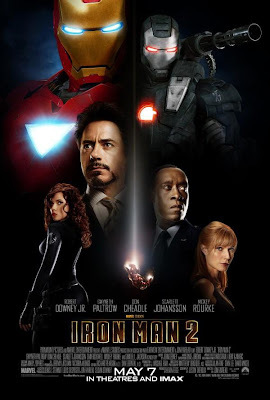 Thematically it does match the first Iron Man poster, but big whoop. I guess I just wanted a little something more from the poster. Another aspect of the poster that I've seen a few people comment on is, where is Sam Rockwell? Hopefully his non-appearance on any of the posters isn't a clue to how brief his part really is. Only time will tell. In other "Iron Man 2" news, a new viral website has been launched. Marvel Entertainment launched Stark Expo 2010, which includes a number of new photos of the fairgrounds, a interactive map and a few videos including one with Tony's father Howard Stark. The website also features a countdown which ends in 38 days from now on May 7th, the very same day "Iron Man 2" releases nation wide. Head over to http://www.starkexpo2010.com/ to see for yourself.